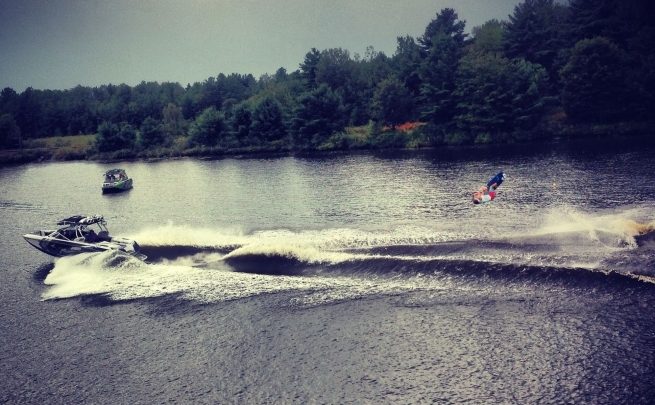 Wakeboarding, Waterskiing and Tubing—Get Involved in the Water Sports Community! Editor’s Note: With over 400,000 lakes, rivers and streams, Ontario and water sports seem like a natural combination. If you’ve never tried it before, where should you begin? Emily Tenwesteneind is an experienced wakeboard competitor, a volunteer for the Roots Wake Series, course instructor for the annual CWSIC course, a level two coach for the Cottage Toys Wakeboard and Water Ski School, and The Wake Institute. Here, she shares her thoughts about water sports in the province. Ontario, amongst many other things, is known for its gorgeous lakes that spread throughout the entire province. So, if you’re thinking about “testing the waters” when it comes to trying a new on-water activity, my advice for you would be to dive right in!